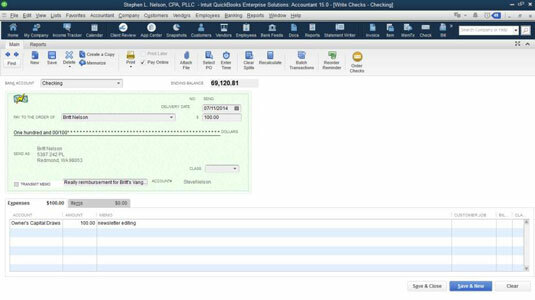 Yes, you can even use QuickBooks to make an online banking payment. Plan to create and send online payments a good week before they’re due. Processing your request and then printing and sending a check takes time for the online bill payment service. And a check that your bank sends doesn’t go through the mail any faster than a check you send yourself. So don’t expect online bill payment to save you any time compared to sending checks that you print or hand-write yourself. You can also click the Write Checks icon on the Home screen. If you’ve written checks with QuickBooks before, you probably recognize your old familiar friend, the Write Checks window. Click the Bank Account drop-down list at the top of the window and then choose the account from which you want to write this check. Choosing the account is a really important step. Make sure that you’re accessing the correct account before you write a check. Select the Pay Online check box. Selecting this check box is another important step. If you don’t select this check box, you aren’t making an online payment; rather, you’re just writing a regular check that you need to print or hand-write. If the payee appears on one of your name lists, the AutoFill feature fills in the name of the payee in the Pay to the Order Of line after you type a few letters. For online bill payment, you must have the correct address. If the address is incomplete, QuickBooks warns you and asks you to correct it. If you haven’t entered a transaction for this person or party before or added that individual or party to a list, QuickBooks asks you to Quick Add or Set Up the payee name. Do that. By the way, QuickBooks makes you collect more information about anyone you’re going to pay with an online payment. Enter the amount of the check next to the dollar sign and then press Tab. QuickBooks writes out the amount for you on the Dollars line. Fill in the Expenses and Items tabs, if necessary. Click the Save & New button or the Save & Close button to finish writing the check. Click Save & New to write another check, or click Save & Close if you’re finished writing checks for the moment. There you have it. Your check is written, entered in the Checking register, and ready to be sent so that your bank or Intuit can print and mail it. And you thought this stuff was going to be tough, didn’t you? People who have grown accustomed to Quicken, a cousin product of QuickBooks, may want to use the Register window to make online payments. You can use the Register window in QuickBooks, too, although doing so isn’t quite as slick. You just enter the payment in the usual way, except that you type the word SEND in the Check Number text box.